Carrot Cake Breakfast Bread served with hot comforting coffee makes ‘unseasonably’ seem novel. Before we move on. Did I not score the cutest loaf pan EVER? Straight off the thrift store shelf, still inscribed with $2.47 on the bottom. Steal!! 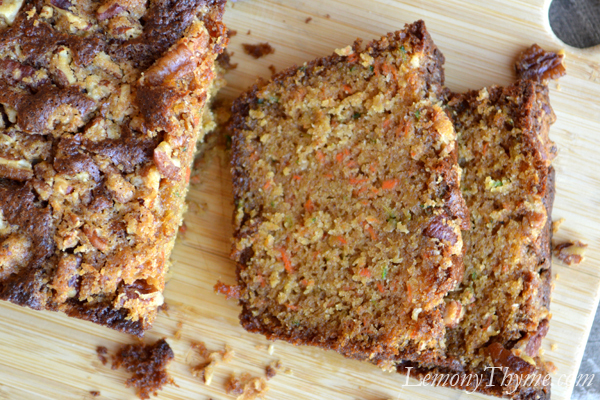 Back to this super moist, ultra flavorful Carrot Cake Breakfast Bread with pecan crumble topping and hints of coconut…. what more can I say, other than you are going to love it!! Preheat oven to 350 degrees. Butter loaf pan. Roll shredded carrot and zucchini in paper towels to remove excess moisture. Then in a medium bowl, combine carrot and zucchini with next six ingredients, through vanilla. In a separate bowl whisk together remaining dry ingredients (excluding pecan crumble topping). Stir dry ingredients in wet until just combined. Pour batter into buttered loaf pan. Combine pecan crumble topping ingredients. Sprinkle on top of batter. Bake for 50 - 55 minutes or until wooden pick inserted in center of bread comes out clean or with a few moist crumbs. I pulled the last batch of carrots of the green house yesterday and I am looking to make some delicious cake with it. I think I’ve found the recipe. Love your work Libby. Thank you so much Mira. I’m envious that you have a green house. What a joy that must be. I hope you love this bread like we do. Welcome Mary Lou. Thank you for visiting and for thinking healthy when feeding all those little ones. You’re going to hate this Aimee, but I found it at Goodwill. I will check the bottom when I get home tonight and see if there’s a brand. It is beautiful. I hope you love the bread like we do. We made this, and it was delicious! It’s going to become a staple in our house I think :) Thank you!! This carrot cake looks so moist and delicious! I was so pleased with it. Super moist and really tasty. Thanks for visiting Elena. Carrot cake for breakfast? I’m in, this looks so moist and delicious. Breakfast and cake in the same sentence? I think I love you. :) I love all of the flavors and textures in this bread. Let ’em cake for breakfast!! I appreciate the love Julie.